is proud to announce the awarding of The President's Volunteer Service Awards to the following people. These Patriotic individuals have worked hard for the military and our wounded and their patriotism is an inspiration to us all. From the Board of the SSFOA we congratulate you all. The Silver Star Families of America has a proud history of volunteer service. Our volunteers are working to meet the needs of their neighborhoods and the community by working to recognize our honored wounded and in other charitable work. In recognition of these outstanding achievements, The Silver Star Families of America is proud to announce the availability of the President’s Volunteer Service Award, a prestigious national honor offered in recognition of volunteer commitment. Established in 2003, this new Award is given by the President of the United States and honors individuals, families and groups who have demonstrated a sustained commitment to volunteer service over the course of 12 months. The Silver Star Families of America has teamed with hundreds of organizations and businesses across the country to deliver this Award to our most outstanding volunteers. As a Certifying Organization of the President’s Volunteer Service Award, we can nominate potential recipients and distribute the Award to those who meet or exceed the Award criteria. Children, adults, families and groups can receive the Award and, given their ongoing service activity, many of our volunteers may already meet the requirements. 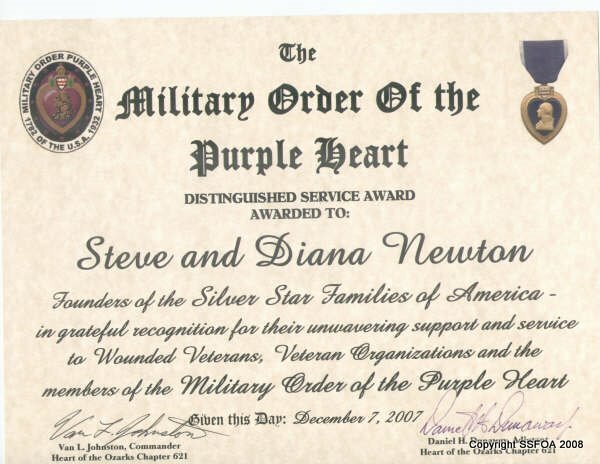 To qualify for the President’s Volunteer Service Award, volunteers simply submit a record of their service hours to The Silver Star Families of America, and we will verify the service and deliver the Award. Volunteer service hours are not limited to those performed on behalf of The Silver Star Families of America. In fact, service hours can be accumulated through work on a variety of projects throughout the year. The only requirement is that the necessary hours be completed within12 months; recipients can qualify for a new Award each year. The President’s Volunteer Service Award is issued by the President’s Council on Service and Civic Participation – created by President George W. Bush to recognize the valuable contributions volunteers make to our nation. 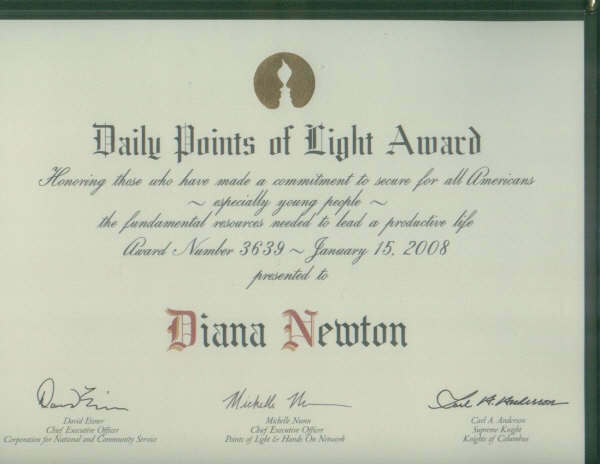 To learn more and find out how to qualify for the Award, contact Diana Newton, our Award administrator, at the Silver Star Yahoo Site or visit www.PresidentialServiceAwards.gov. USA Patriotism! recognizes Steven Newton for his noble patriotic efforts!